Here we present a series of articles printed in Sami language in the newspapers Min Áigi and Ávvir from 2007 to 2013. 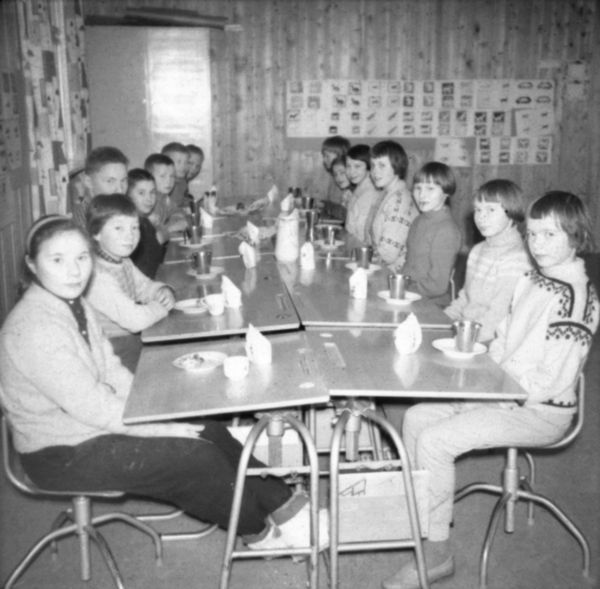 The basis of the articles are stories which have been collected through the project “Sami school history”. There are edited 6 books with stories and articles from school life in the Norwegian part of Sápmi. In these articles there are many quotes from the books, and we refer to the articles the quotes are taken from, to make it possible to read the entire stories there. The chief editor of Sami school history, Svein Lund, is editing this series of articles. In addition Elfrid Boine, Siri Broch Johansen and Siv Rasmussen are part of the editorial staff. In the last article we asked whether it was forbidden for the teachers to use Sami during the time of norwegianization. Today we ask whether it was also forbidden for pupils to speak Sami in the school. The instructions were primarily concerning the teaching and that children having to read and report the homeworks in Norwegian. But in the instructions from 1880 and 1898 there is a paragraph which points further. In §12 the teacher is instructed to use Norwegian also when speaking to the children outside the lessons, and in the same paragraph he is also instructed to "explain the elders, in particular the parents, whose children he is teaching, the importance to be able to speak and read Norwegian". In the instruction there is no order for the teacher to make sure that the children do not speak Sami to each other. To the extent that this has been practiced, it mus have it's roots elsewhere than the instruction. – We did not experience any ban to speak Sami, we pupils spoke solely Sami together in school, the teacher was the only one we had to approach in Norwegian. But it was not always we found the words we needed. – In the school everything was done in Norwegian. Some pupils spoke Sami with each other, I do not remember to have heard anyone being scolded for speaking Sami. – I never heard that it was forbidden to speak Sami in school, and was quite surprised when I learned that many, many years later. I've asked other Norwegian speaking teachers who have been in Kautokeino, and they all say the same. – In school the teachers had to use solely Norwegian. But we never heard that the children were not allowed to speak Sami or Finnish. – My Grandmother never made it a secret that she was Sami. She only spoke Sami when she in 1906 started a school where everything was done in Norwegian. It was difficult the first years when the pupils did not understand the teacher and were denied to speak together in their own language. 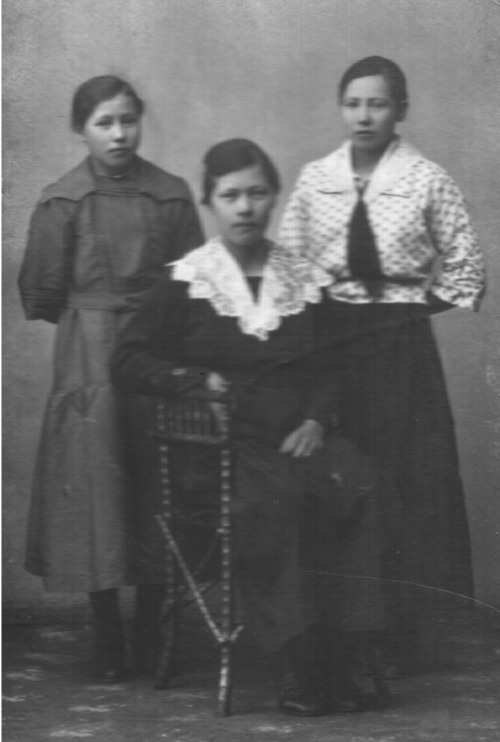 Three sisters at Seiland: Martha, Ella and Inga Johannessen. Martha was the grandmother of Mimmi Bæivi, who tells the story of her grandmothers school time. – When we went to school here in Repvåg you were not allowed to speak Sami. I did not know a single word of the Norwegian language when I came to school, not a single word. Norwegian was the language in school and the foolish practice was still that we children were not allowed to speak Sami to each other, so the time would not pass in any way. When we small children were running outside and wanted to speak Sami, we were not allowed to do so. – The teachers we had could speak neither Sami nor Kven. We got a clear message that at school we should only speak Norwegian. Though I am not sure who decided upon this policy. – We got a clear message from the teachers: It is not allowed to speak Sami. That's how the law was back then. The children did not speak Sami at all in the school, and when they came home they did not want to speak Sami there either. – I started school in 1934. In school we were not allowed to speak Sami, we were not even allowed to speak Sami to the other children. Both the teachers and the home sister said so. Here we were only supposed to speak Norwegian. – We weren’t allowed to speak Sami, but what were we supposed to speak then when that was all we knew? – In the classroom Norwegian was the only spoken language, and I didn't understand a word. We didn't dare to speak when we entered the classroom. We weren't allowed to speak Sami, and we didn't know Norwegian. We sat there listening, although we couldn't understand a word. – If they spoke Sami among themselves when they were outside playing, or in the classroom, they got both a box on the ear and three strikes on the fingers with the pointer, and it hurt very much when the angry teacher hit the children on the fingers. – We were taught that Sami was not a language in school, it was not allowed to speak Sami. So in our area the school was a great institution of norwegianization. – I also remember that the teacher didn’t allow us children to speak Sámi, and that he grabbed us by the neck. And that teacher was a Sámi speaker himself. Alfon Andersen from Boltås / Vatnjavárri in Skånland has told about his first year in school, 1946, in a reader's letter. Him and his twin brother Harald did not speak any Norwegian when they started school. They got strikes on the hands with the ruler if the had been speaking Sami in the breaks. Some children were pulled by the hair. Alfon says: "We small children learned fast, and because of hard strikes on small children's hands and strong hair pulling, we soon stopped speaking Sami". – Dad has told that when he went to school and the pupils spoke Sami, they were put in the corner and beaten with a ruler. – Therefore I spoke both Sami and Norwegian when I started the boarding school in Kokelv in 1962. We were three children who spoke Sami there. The others came from small places in Revsbotn. We used to speak Sami to each other, but had to do so secretly, because they denied us to speak Sami both in the school and in the dormitory. From Kokelv boarding school. 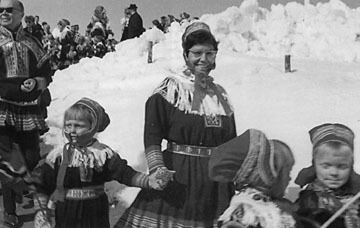 There children were refused to speak Sami in the 1960's. – The manager of the dormitory did not speak Sami, neither did the home sister. The maids spoke Sami, but they were not allowed to speak Sami with us, so we had to speak Sami secretly. – The employees in the dormitory, as I have later learned to know them, did all speak Sami. But the language they spoke in the dormitory was Norwegian. I do not know if they could have been ordered to use solely Norwegian, as a means to improve the Norwegian of the children in school. (3) By the best possible way instruction the children to use the Norwegian language when speaking to each other also outside school hours. (4) Through occasionally reminding the Lappish parents on the necessity of assisting the school in the norwegianizing. Johan Sirkka ... – he was teacher in Repvåg. He prohibited us to speak Sami to the children at home, and how often we were together. I remember one time in particular, when we almost got into a fight. He says: You are not allowed to speak Sami with the children! They become so stupid that they don't understand anything when they come to school! – What I remember best from my schooling, is when the teacher got furious because I spoke Sami in the break. It was not allowed. I even had to do detention, and the teacher walked several kilometers from the school in Elvebukt and to our house in Vigeluft on a Sunday to speak to my parents. Since that time they did not speak Sami at home anymore when I heard it. – Odd Finnmark – it was an experience of having arrived abroad: «Everybody speak Norwegian. No one needs to speak Finnish or Sami», was the message we were given. I immediately became an obedient sergeant who took the Norwegian plight seriously. There is no need of neither Sami nor Finnish here! – The children are doing their homeworks in Norwegian. ... In the breaks while playing, the children are ordered to speak Norwegian to each other, and also the teacher is solely speaking (by principle) Norwegian with the children and the parents. The question remaining unanswered is whether there at any time was given orders from the ministry or the Director of schools that the teachers should deny the pupils to speak Sami. Thus far we have not been able to find any evidence for this. Providing that someone has knowledge of this, the editorial staff of Sami school history is very interested in information.